There was so much to LOVE about this gorgeous wedding! 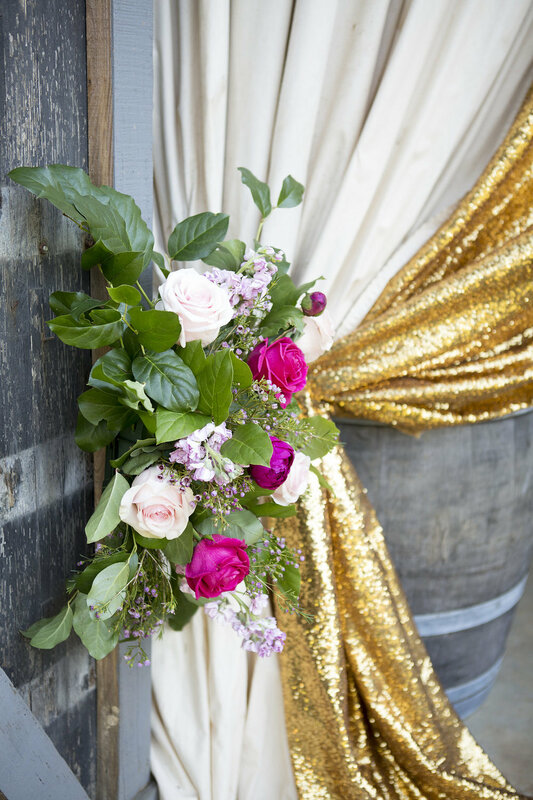 This sweet couple chose to tie the knot in front of The Barn, and the addition of gold glittery curtains at The Barn's front doors took it to the next level and made this wedding one to remember! Jessica and Eli chose our classic Elopement Collection and personalized it to their needs by adding reception tables and hors d'oeuvres. Jessica said it was "short and simple," which was just what they were hoping for! Paxton Anderson (from Paxton Goates Photography) took their beautiful photos, and we were thrilled to work with her again! She captured the dreamiest, most romantic photos, and we can't stop swooning! Jessica and Eli were married at The Barn at Twin Oaks Ranch on June 7, 2018. Their color palette included shades of bright pink and touches of sparkly gold. "Pink is my favorite color so I always knew that would be the color scheme of my wedding and I thought the gold added a nice sparkly touch," Jessica said. Jessica's bouquets and florals were FULL of pink flowers, including bright pink peonies and roses in hot pink and light pink. They were feminine and GORGEOUS. "My bouquet was perfect!" she said. "I wasn't even sure what I wanted but Lesleigh was able to take my super vague requests and create a bouquet that I absolutely loved." Umm, we are OBSESSED with Jessica's dress, which she found at Danielle's Bridal. 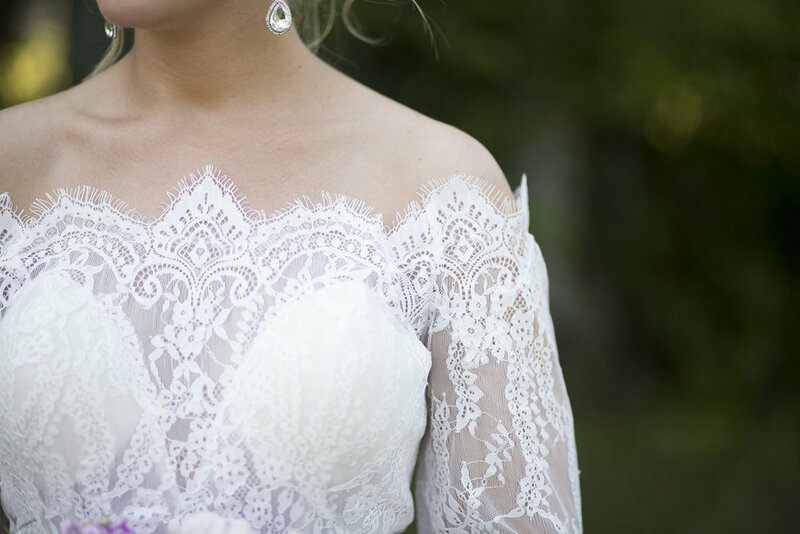 We love a bridal gown with sleeves, and the bell sleeves on this one were so pretty! 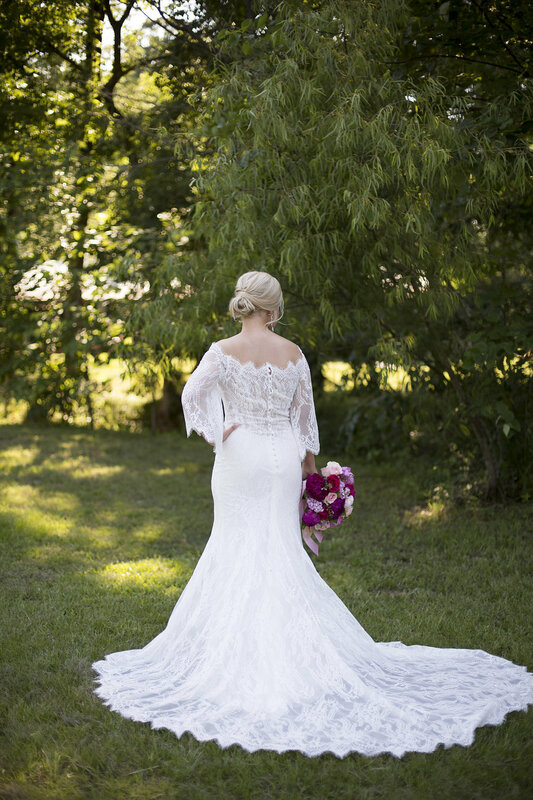 The beautiful lace, off-the-shoulder neckline and gorgeous train made this dress extra special and unforgettable! Jessica's pretty bridesmaids wore long, elegant black dresses with different necklines and details. The dresses were timeless, and they looked incredible with the bridesmaids’ hot pink bouquets! Eli wore a black suit with a black bow tie and black suspenders - a fun, modern addition to a classic look! His groomsmen also wore black suspenders and pink bow ties. This was probably the classiest bridal party ever! Jessica and Eli's ceremony site was unique and gorgeous, and it was for sure the highlight of this wedding for us! They were married in front of The Barn's front doors, and our team made it even more beautiful with the addition of glittery gold drapes. They made such a statement that not much else was needed, so our team added a small pink floral arrangement at each door, and that was it for ceremony details! How pretty are our signature gold chairs with the gold curtains?! Jessica said this set-up "worked out perfectly for our smaller wedding since everyone was a little less spread out." One of the most memorable moments of the day for Jessica came during the ceremony. "The one thing I'll always remember is Eli's face when he turned around as I was walking down the aisle," she said. Their ceremony was intimate and sweet, with their closest family and friends watching as they said I do. These beautiful portraits of Jessica and Eli look like they're straight from a movie! The lighting is so pretty and magical in these, and they are soooo romantic and dreamy! Jessica and Eli, y'all are really pretty people. And Paxton, you are incredible! Our signature Elopement Collection includes a cake with a beautiful display, but it doesn't typically include dinner or any other reception details. However, we are always happy to customize any of our collections to meet our couples' needs, and Jessica and Eli added on a short (but gorgeous!) reception with hors d'oeuvres. Their reception tables were girly and glamorous, with glittery gold table runners, hot pink fabric, gold lanterns, and pretty pink florals in gold vases. "The Barn was decorated even better than I could have imagined," Jessica said. They had a super simple white cake (from Kneading Hands Bakery) topped with a few flowers, as well as a little bit more glittery gold in their cake display. The perfect addition to the prettiest reception! 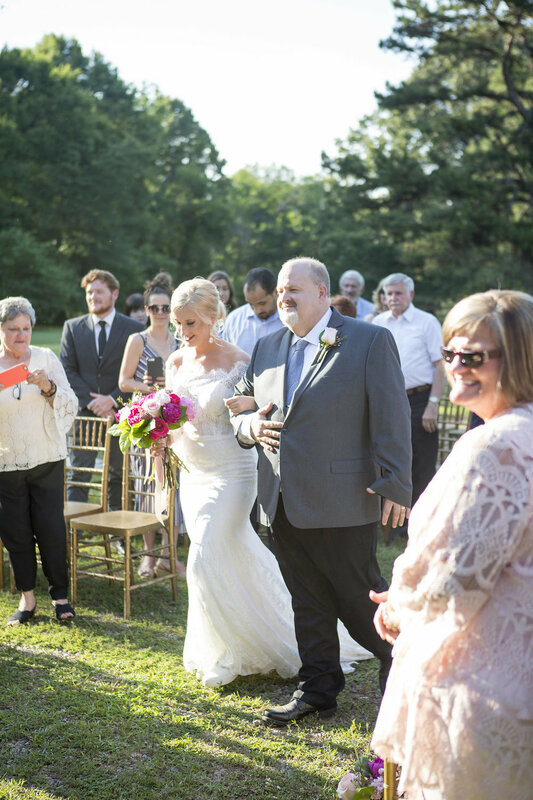 Their guests held sparklers as they made their grand exit from The Barn, and then the newlyweds headed off to Disney World for a fun, romantic honeymoon! "Weddings are about the bride and groom, but who gets the majority of them there? Mother’s do and this mother of the bride was super impressed. As MOB I wanted to shield my daughter from all the usual wedding stress thinking I would head off any potential missteps. Lesleigh was way ahead of me! The set up was beautiful with every detail taken care of and my daughter’s wedding was an elopement package. The decorations, the flowers, the cake and the food were perfect. I can not say enough good things about her. The only thing that could have been better was the heat and I’m sure if she could have controlled that she would have. Mothers of the bride, if you're going to help your daughter with her wedding, talk to these ladies."